Members of the carrot (or parsley) family include plants we often use as spices or as vegetables. 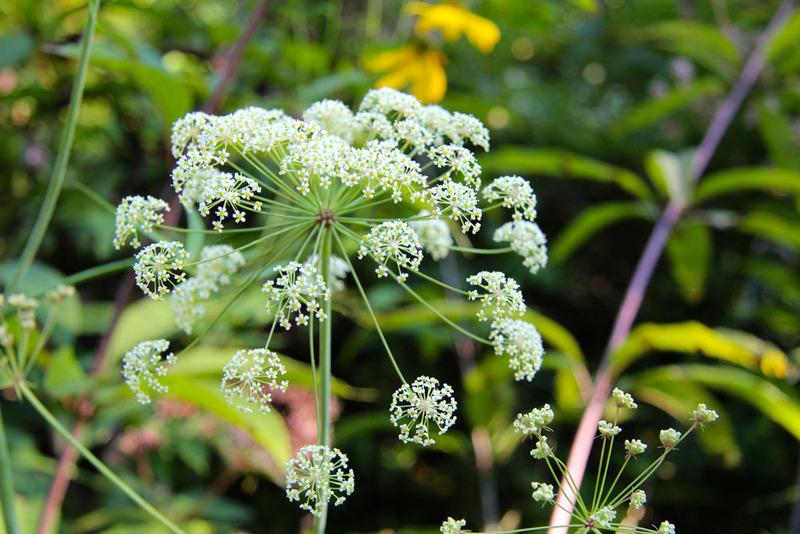 Most have umbel-shaped flowers (think umbrella!) that are quite fascinating structurally. 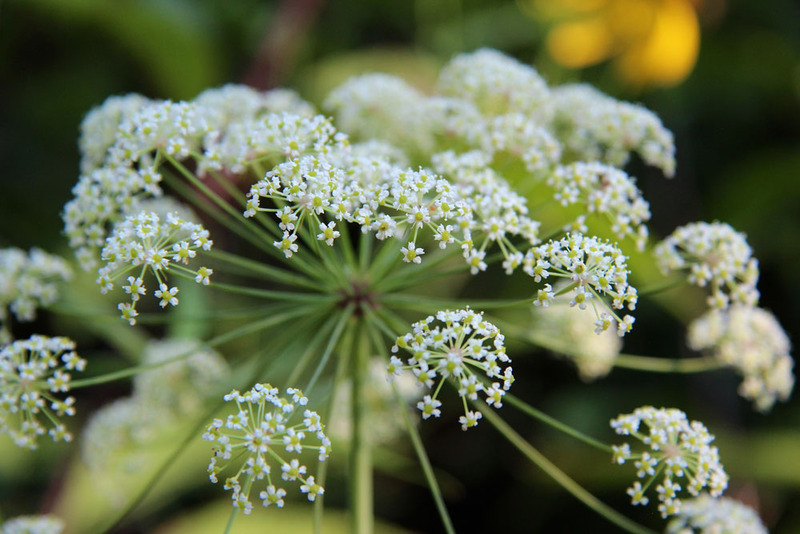 You are probably familiar with Queen Anne’s Lace, or dill as common examples of plants with umbel-shaped inflorescences. 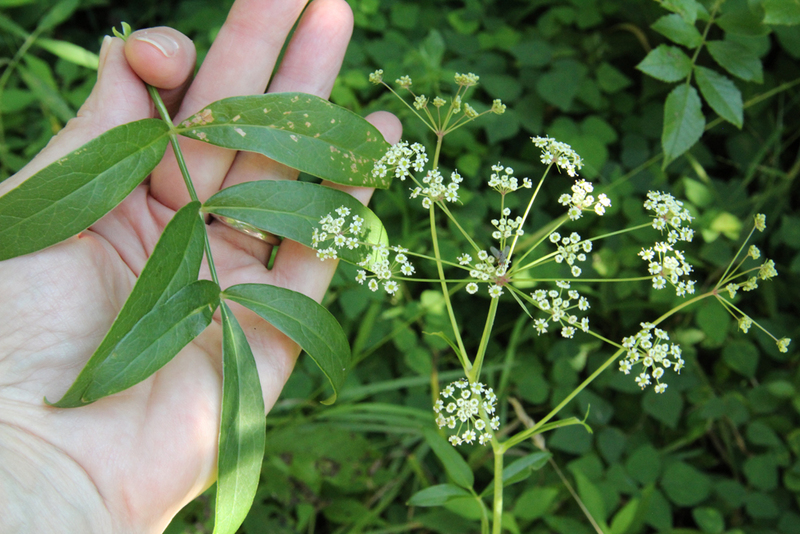 Here is another member of the Carrot Family that blooms in late summer: Cowbane. Standing almost five feet tall, cowbane is sparsely branched and has just a few pinnately divided leaves that are arranged alternately. The lance-shaped leaflets lack petioles (sessile) and can range in number from 5 to 11. The leaflets can be entire or slightly toothed. As noted above, the flowers are arranged in broad umbels (3-6 inches across!). Each individual flower is very small, with five tiny white petals with yellow centers. The seeds are “winged”. This plant is sometimes called Stiff Cowbane, a name that refers to the fact that the plant is poisonous to cattle and other mammals. Look for it growing in wet areas. These plants were photographed near Tom’s Creek on the Deerfield Trail in Blacksburg. Cowbane reminds me of exploding fireworks. Think I’ll nickname it “Fourth o’ July”! Thanks for your posts which I always enjoy. “Happy (hiking) trails” to you from Roanoke. Great analogy! It does look like exploding fireworks! Thanks!